Profession of a doctor is to save life of a patient and not to leave it on the mercy of his/ her destiny by refusing to administer medical treatment to him/ her, the Bench said. Taking serious note of the strike adopted by junior doctors in State Medical Colleges in the state which resulted in death of a number of people, the Allahabad High Court has held that Doctors have no legal or otherwise right to proceed on strike having effect of denying medical treatment/ administration of medicines, care to ailing people. Division Bench comprising of Justices Sudhir Agarwal and Rakesh Srivastava, in a PIL moved by a practicing advocate, has also asked the Government to provide compensation to legal heirs of victims who died unattended by the doctors, by paying a sum of Twenty Five Lakhs, which is to be recovered from the salaries/allowances of doctors going on protest/abstention from duty/ strike. 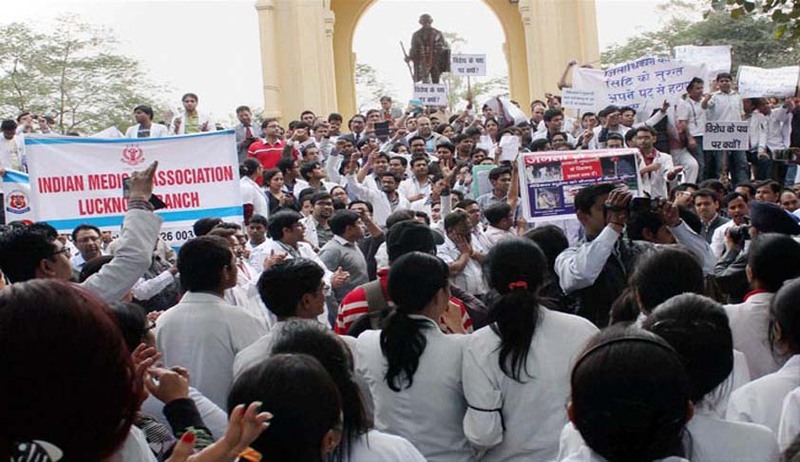 The bench also observed that refusing to attend a patient is a serious professional misconduct on the part of doctors and such conduct shall be communicated to Medical Council of India for considering cancellation/ revocation or suspension of license to practice. State Government shall constitute a High Powered Committee headed by a Judicial Officer not below the rank of Additional Legal Remembrancer from Legal Remembrancer Department, to conduct an inquiry and submit its report positively within two months of its constitution finding out whether any patient in State Medical Colleges/ Hospitals have died since 30th May, 2016 till today i.e. 2nd June, 2016 on account of protest/ abstention from duty/ strike etc. of doctors working therein. The aforesaid committee shall be constituted within a week from today. If any death has occurred Government shall provide compensation to legal heirs of victims, by paying a sum of Rs. 25, 00,000/-(Twenty Five Lacs). The amount of compensation, paid above, shall be recovered from the salaries/allowances etc., as the case may be, of doctors going on protest/abstention from duty/ strike etc. The Principals of State Medical Colleges, as well as Vice Chancellor, King Gorge Medical University, Lucknow shall identify doctors who have gone on strike protest/abstention from duty etc. and they shall be administered a serious recordable warning besides denial of salary/ allowances/ honorarium, as the case may be, and their period of training etc., shall be extended by the aforesaid period of non-working. Besides above, criminal and tortious action by appropriate authority/victim would/may be open to be taken against such erring doctors. Government shall also take disciplinary action by treating the aforesaid conduct as serious misconduct justifying major penalty. This policy decision and guideline shall be formulated and communicated to all the doctors at the time of entering the service and those who are already in service shall be communicated within three months from today. A report of compliance of this order shall be submitted to the court under personal affidavit of Principal Secretary, Medical Health and Family Welfare as well as Secretary, Medical Education, by 10th September, 2016.